C&C Sutlery has a huge selection of CS Enlisted Shell Jackets. All Enlisted Shell Jackets with the exception of STANDARD Colors, Styles, and Sizes as listed below are custom made specifically for you and are subject to a restocking fee. 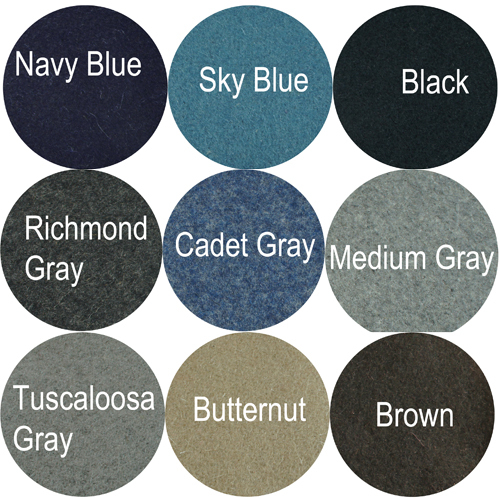 STANDARD SHELL JACKETS: Sizes 38-48 Regular Length; Enlisted; Unlined; Untrimmed; 7-Button Front Shell Jacket in Navy Blue or Medium Gray Wool; All Budget-line Shell Jackets. NEW, NEVER WORN SIZE 44 C&C Sutlery Artillery CS Shell Jacket in MEDIUM GREY wool has artillery red solid trim on collar and cuff, 7-button front, a plain back and CSA buttons. It is UNLINED. Only 1 Available. SOLD AS IS. All sales FINAL. This C&C Sutlery CS Shell Jacket is Untrimmed and Unlined. It has a plain back, one inside pocket, and CSA, Block "A", Block "C", or Block "I" buttons. 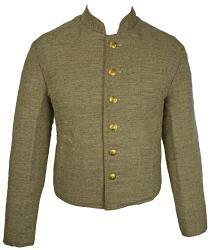 It is available in a 6, 7, 8 or 9 button front. The 7 button front is the most common. It is available in a variety of wool colors. This shell jacket, when made in MEDIUM GREY wool, is NOT subject to a 20% restocking fee. 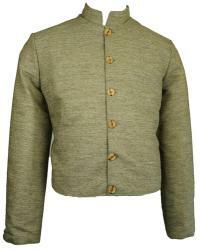 This C&C Sutlery CS Shell Jacket is an Untrimmed jacket with a plain back and CSA, Block "A", Block "C", or Block "I" buttons. 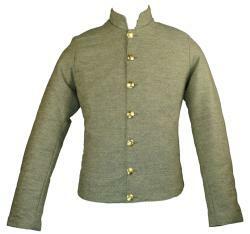 It is lined with a cotton muslin lining, has one inside pocket, and is available in a 6, 7, 8 or 9 button front. The 7 button front is the most common. It is available in a variety of wool colors. 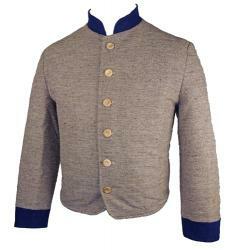 This is a CS Jean Wool shell jacket with a plain back and CSA, Block "A", Block "C", or Block "I" buttons. 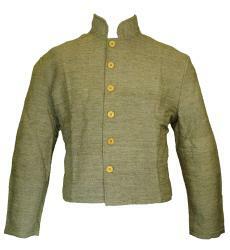 It is lined with a Muslin lining, with one inside pocket, and is available in a 6, 7, 8 or 9 button front. The 7 button front is the most common. 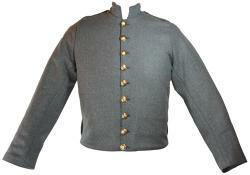 Belt loops and epaulettes are additional options. It is available in Gray or Brown Jean Wool. 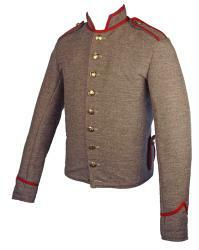 This C&C Sutlery Artillery CS Shell Jacket has artillery red solid trim on collar and cuff, a plain back and CSA or Block "A" buttons. 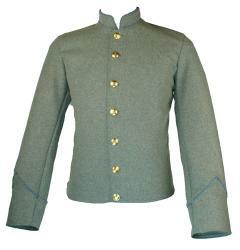 It is unlined, with one inside pocket, and is available in a 6, 7, 8 or 9 button front. The 7 button front is the most common. It is available in a variety of wool colors. 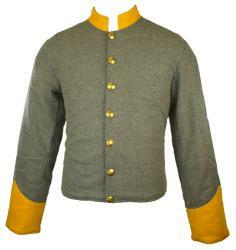 This C&C Sutlery Cavalry CS Shell Jacket has cavalry yellow Solid Trim on the collar and cuff, a plain back and CSA or Block "C" buttons. It is unlined, with one inside pocket, and is available in a 6, 7, 8 or 9 button front. The 7 button front is the most common. It is available in a variety of wool colors. 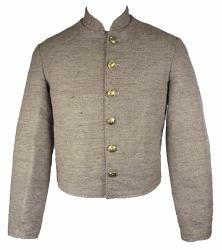 The jacket pictured is made of Richmond Grey wool. 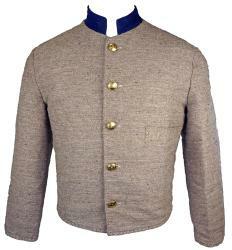 This C&C Sutlery Infantry CS Shell Jacket has infantry blue Solid Trim on the collar and cuff, a plain back and CSA or Block "I" buttons. It is unlined, with one inside pocket, and is available in a 6, 7, 8 or 9 button front. The 7 button front is the most common. This shell jacket is available in a variety of wool colors. 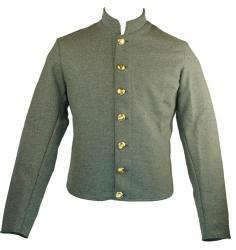 This C&C Sutlery Medical or Militia CS Shell Jacket has Medical/Militia black Solid trim on the collar and cuff, a plain back and CSA buttons. It is unlined, with one inside pocket, and is available in a 6, 7, 8 or 9 button front. The 7 button front is the most common. It is available in a variety of wool colors. 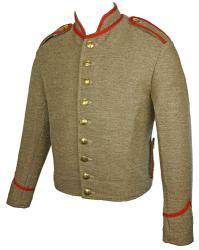 This C&C Sutlery CS Shell Jacket has Staff Branch of Service Solid trim on the collar and cuff. 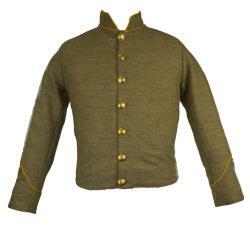 It has a plain back and CSA buttons. It is unlined, with one inside pocket, and is available in a 6, 7, 8 or 9 button front. The 7 button front is the most common. 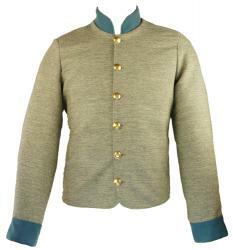 This shell jacket is available in a variety of wool colors. 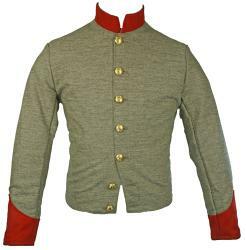 This C&C Sutlery Artillery CS Shell Jacket has artillery red Piping Trim on the collar and cuff, a plain back and CSA or Block "A" buttons. It is unlined, with one inside pocket, and is available in a 6, 7, 8 or 9 button front. The 7 button front is the most common. It is available in a variety of wool colors. 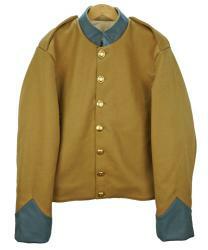 This C&C Sutlery Cavalry CS Shell Jacket has cavalry yellow Piping Trim on the collar and cuff, a plain back and CSA or Block "C" buttons. It is unlined, with one inside pocket, and is available in a 6, 7, 8 or 9 button front. The 7 button front is the most common. It is available in a variety of wool colors. 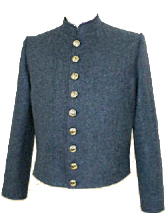 The jacket is shown with optional chevrons. 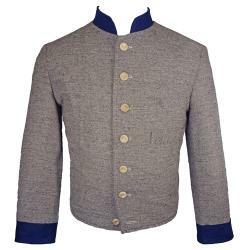 This C&C Sutlery Infantry CS Shell Jacket has infantry blue Piping Trim on the collar and cuff, a plain back and CSA or Block "I" buttons. It is unlined, with one inside pocket, and is available in a 6, 7, 8 or 9 button front. The 7 button front is the most common. This shell jacket is available in a variety of wool colors. 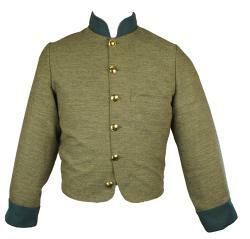 This C&C Sutlery Medical or Militia CS Shell Jacket has Medical/Militia black Piping trim on the collar and cuff, a plain back and CSA buttons. It is unlined, with one inside pocket, and is available in a 6, 7, 8 or 9 button front. The 7 button front is the most common. It is available in a variety of wool colors. This C&C Sutley CS Shell Jacket has Staff buff Branch of Service Piping trim on the collar and cuff. 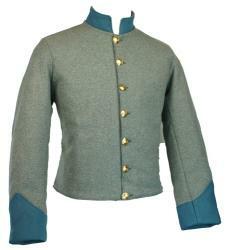 It has a plain back and CSA buttons. It is unlined, with one inside pocket, and is available in a 6, 7, 8 or 9 button front. The 7 button front is the most common. It is available in a variety of wool colors. 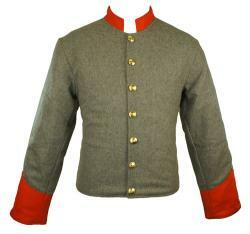 Early War shell jackets feature more trim, more buttons, and were often designed by the militia units. This C&C Sutlery Early War CS Shell Jacket features branch of service color solid trim on the collar and cuff and a piping trim on lapels and the bottom edge of the jacket. This jacket has a 9 button front in CSA, Block "A", Block "C", or Block "I" buttons and 2 buttons on each cuff. It is lined with a cotton lining and has one inside pocket. It is available in a variety of wool colors. Click on the picture for more images. 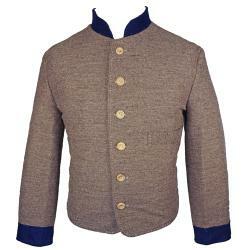 This C&C Sutlery CS Department of Alabama shell jacket is made of Jean Wool, has a 6 piece body, 2 piece sleeve, features a 5 Button Front, has 1 exterior pocket, 1 inside pocket, and is lined in a cotton lining. The back hem of the jacket is straight across. This shell jacket is available in Gray or Brown Jean Wool. CSA, Block "I", or Wood buttons are available. This C&C Sutlery CS Atlanta Depot Shell jacket is made of Medium Grey Wool, has a 6 piece body, 1 piece sleeves, features a 6 Button Front, has 2 inside pockets, and is lined in a cotton lining. The back of the jacket is pointed. CSA, Block "A", "C", or "I", or Wood Buttons are available. This C&C Sutlery CS Columbus Depot Shell jacket is made from Jean Wool Cloth, has a 6 piece body, 1 piece sleeves, features a 6 Button Front of Block "I" Buttons, and is lined with a Muslin lining. 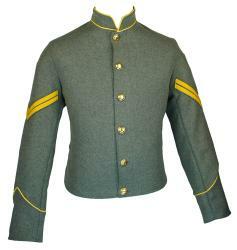 The front hem of the jacket is rounded and the back hem of the jacket is pointed. The Type #1 jacket has 2 inside pockets. 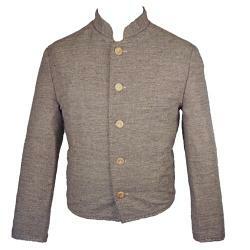 This jacket is available in Gray or Brown Jean Wool. This C&C Sutlery CS Columbus Depot Shell jacket is made from Jean Wool Cloth, has a 6 piece body, 1 piece sleeves, features a 6 Button Front of Block "I" Buttons, and is lined with a Muslin lining. The front hem of the jacket is rounded and the back hem of the jacket is pointed. The Type #2 has one Exterior Breast Pocket on the left side and 1 interior pocket. This C&C Sutlery CS Columbus Depot Shell jacket is made from Jean Wool Cloth, has a 6 piece body, 1 piece sleeves, features a 6 Button Front of Block "I" Buttons, and is lined with a Muslin lining. The Type #3 front hem is square instead of rounded, the back hem of the jacket is straight instead of pointed. The jacket has one Exterior Breast Pocket on the left side and 1 interior pocket. 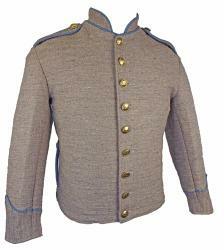 The C&C Sutlery Richmond Depot Shell Jacket has a 6 piece body, 2 piece sleeves, and 9 Button Front of CSA, Block "A", "C", or "I" buttons. The bottom of the jacket front is square cut. The back hem of the jacket is straight across. The jacket is lined with cotton lining and has an inside pocket. 3/8" tape trim is available instead of piping trim. 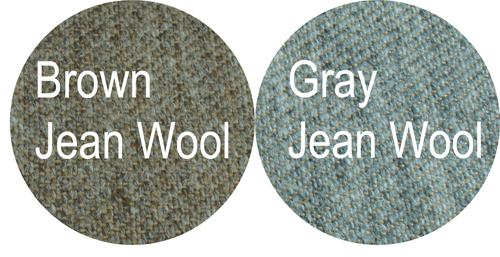 Select Brown or Gray Jean Wool. 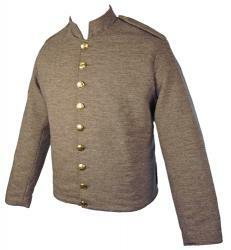 The C&C Sutlery Richmond Depot Shell Jacket has a 6 piece body, 2 piece sleeves, and 9 Button Front of CSA, Block "A", "C", or "I" buttons. The bottom of the jacket front is square cut. The back hem of the jacket is straight across. 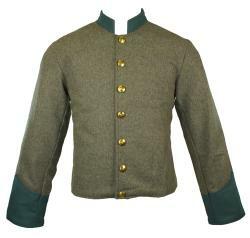 The jacket is lined with cotton lining and has an inside pocket. 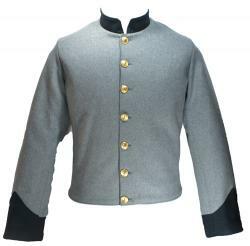 The C&C Sutlery Richmond Depot Shell Jacket has a 6 piece body, 2 piece sleeves, and 9 Button Front of CSA, Block "A", "C", or "I"buttons. The bottom of the jacket front is square cut. The back hem of the jacket is straight across. 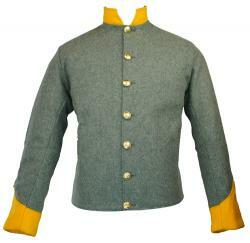 The jacket is lined with cotton lining and has an inside pocket. This C&C Sutlery CS Richmond Howitzer Artillery Shell Jacket features artillery red piping trim around the collar and shoulder epaulettes. 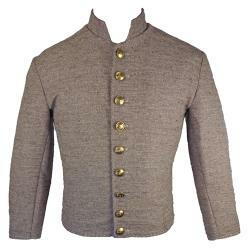 The jacket has a 9 button front of Block "A" buttons, 2 side belt loops, and is lined with a Muslin lining. 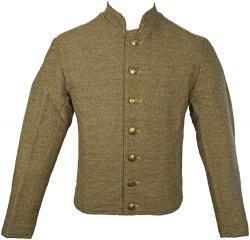 The jacket is available in a variety of wool colors, but is usually made in Richmond Gray. 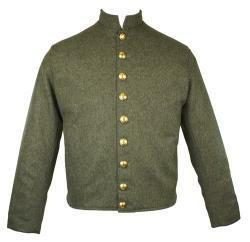 This shell jacket was worn by the 1st Virginia Cavalry organized into a regiment by J.E.B. Stuart. The single biggest distinguishing factor of a typical 1st Virginia Cavalryman is the shell jacket with striped facings, or "Hussar Bars" on the front. 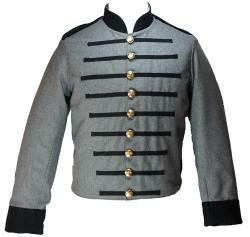 This reflected the American fascination with European styles in pre-war militia units. Although the traditional trim color for cavalry was yellow, the 1st Virginia wore black-trimmed uniforms instead, including a broad-brimmed black hat, often with a black plume. 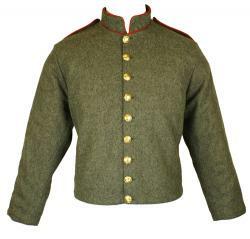 This Early War shell jacket features "Hussar Bars" on the 9 button front, has epaulettes, square sleeve trim on a straight cuff, belt loops, is lined with a cotton lining and has one inside pocket. 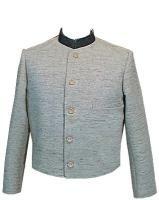 The jacket is made of Medium Gray wool. CSA or Block "C" are available. 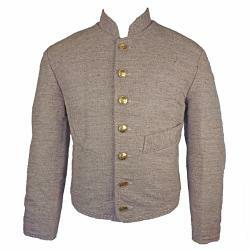 This shell jacket is an Early War jacket worn by the 11th Mississippi Infantry. Mississippi adopted red as the color for Infantry instead of blue. 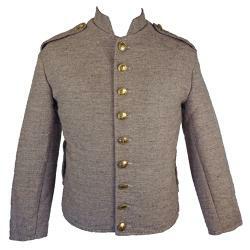 This enlistedman's shell jacket features a 7 button front, has square sleeve trim on a straight cuff, is lined with a cotton lining and has one inside pocket. 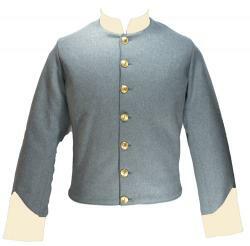 The jacket is made of Medium Gray wool. CSA or Block "I" are available. NEW, never worn C&C Sutlery CS Shell Jacket SIZE 46 made of BUTTERNUT wool with Solid INFANTRY SKY BLUE Branch of Service trim on the Collar and Cuff. 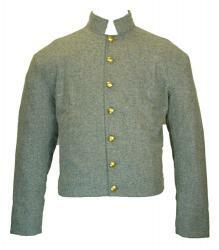 This jacket is a 7 button front with CSA buttons, has Epaulettes, and is lined with a Muslin lining. Picture is an EXAMPLE ONLY. Click on the picture for more EXAMPLE images.